Available in cask and both 330ml and 500ml bottles. 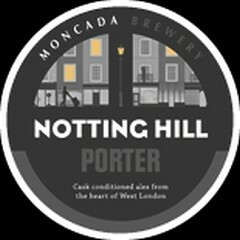 Notting Hill Porter is a traditional porter with a complex malt profile giving balance notes of chocolate, caramel and coffee. Brewed with all UK hops. Bottle from Oddbins. Poured very dark brown with an average sized beige head. Aroma of roasted malt, chocolate, dark fruit. Medium to heavy sweetness, moderate roasted bitterness. Medium body, slight oily texture, soft carbonation. Decent. Bottle from OddBins Portobello. Great Porter with creamy cappuccino colored head and deep black body. Coffee, chocolate, roasted caramel and hints of fruitiness. Bottle from a trade with Grumbo, thanks! Aroma is roasted malt, caramel, cocoa, dark chocolate, hint of ash, touch of coffee. Medium sweet flavour with a moderate bitter finish. Body is medium with a slight creaminess. Solid Porter! This was a nice surprise from a small brewery. Nice roast flavor without being too dry. Rich mouthfeel and an inviting finish. Well done. Bottle from Ales by Mail. Pours black as Coke with a creamy tanned head. Aroma got some burnt and charred notes, caramel and grains, chocolate and liquorice, a solid aroma.Same goes for the taste, with a more dominant charred note, weak resiny hop finish, a bit watery body, but overall a solid porter. Bottle. home. After a long shift boy did I need this!! Big roasted malt flavour. Super clean Simpson’s malt characteristics. Lots of chocolate, tar, molasses, leather, blackcurrants, prunes, redcurrants and cold espresso. Some treacle and caramel. A dry but fruity finish which is long and lasting. Good creme like an espresso. Great classic porter. Clear dark brown colour, beige head. Aroma of roasted malts and milk chocolate. Quite bitter flavour, light sweet notes, chocolate. Finish chocolate, roasted malts and coffee. Bottle. Nice black-amber pour with a foamy white head. Chocolate malts, touch of mocha. Quite a dry and quick finish, which makes it fairly drinkable for a darker beer. Very solid. September 10, 2014 - from a 500ml bottle - thanks, Ang! Pretty much black pour, thick-looking frothy beige head. A simple and clean nutty/light coffee porter, reasonably dry, mild alcohol, enough bitterness to balance - average body, finishes fairly quick, a dry roast aftertaste - sort of coffee beans and dark chocolate - solid. Bottla at home from Oddbins London Bridge. Black coloured pour with dark red hues in the light. Lasting mid tan head. Aroma is earthy cocoa, ashy roast, little jammy fruits, charrred wood. Flavour gives earthy roasted barley, woodlandd berry, little jammy strawberry, dry ashy roast, char. Lingering smoke. Palate is medium bodied, mnoderate to high carbonation, little chalk on the tongue. Really solid porter with good depth.